WE TRADE www.signalmotors.co.nz YES WE FINANCE Issue week Friday 3rd June 2016 Best FREE PLEASE TAKE ONE Motorbuys TM www.bestmotorbuys.co.nz For advertising enquiries, phone Lea Godfrey 021 277 3086 No. 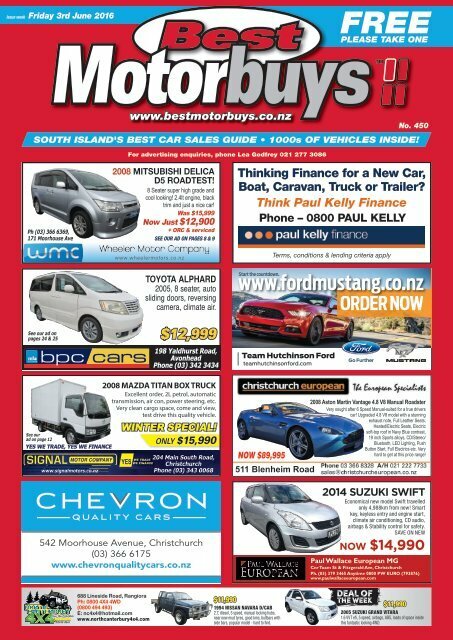 450 SOUTH ISLAND'S BEST CAR SALES GUIDE • 1000s OF VEHICLES INSIDE! Ph (03) 366 6369, 171 Moorhouse Ave 2008 MITSUBISHI DELICA D5 ROADTEST! 8 Seater super high grade and cool looking! 2.4lt engine, black www.wheelermotors.co.nz trim and just a nice car! Was $15,999 Now Just $12,900 + ORC & serviced See our ad on pageS 8 & 9 Thinking Finance for a New Car, Boat, Caravan, Truck or Trailer? Think Paul Kelly Finance Phone – 0800 PAUL KELLY Terms, conditions & lending criteria apply See our ad on pages 24 & 25 TOYOTA ALPHARD 2005, 8 seater, auto sliding doors, reversing camera, climate air. $12,999 198 Yaldhurst Road, Avonhead Phone (03) 342 3434 See our ad on page 12 YES WE TRADE, YES WE FINANCE WE WE WE TRADE WE WE WE TRADE TRADE WE FINANCE www.signalmotors.co.nz YES YES WE TRADE WE FINANCE www.signalmotors.co.nz WE FINANCE www.signalmotors.co.nz WE FINANCE www.signalmotors.co.nz www.signalmotors.co.nz WE TRADE YES WE FINANCE www.signalmotors.co.nz WE TRADE YES WE FINANCE signalmotors.co.nz 2008 Mazda titan box truck Excellent order, 2L petrol, automatic transmission, air con, power steering, etc. Very clean cargo space, come and view, test drive this quality vehicle. WINTER SPECIAL! ONLY $15,990 WE TRADE WE 204 Main TRADE South Road, YES WE FINANCE www.signalmotors.co.nz Christchurch WE FINANCE www.signalmotors.co.nz Phone (03) 343 0068 542 Moorhouse Avenue, Christchurch (03) 366 6175 www.chevronqualitycars.co.nz NOW $89,995 511 Blenheim Road 2008 Aston Martin Vantage 4.8 V8 Manual Roadster Very sought after 6 Speed Manual-suited for a true drivers car! Upgraded 4.8 V8 model with a stunning exhaust note, Full Leather Seats, Heated/Electric Seats, Electric soft-top roof in Navy Blue contrast, 19 inch Sports alloys, CD/Stereo/ Bluetooth, LED Lighting, Push Button Start, Full Electrics etc. Very hard to get at this price range! 2014 Suzuki SWift Economical new model Swift travelled only 4,988km from new! Smart key, keyless entry and engine start, climate air conditioning, CD audio, airbags & Stability control for safety. SAVE ON NEW NOW $14,990 Paul Wallace European MG Cnr Tuam St & Fitzgerald Ave, Christchurch Ph. (03) 379 3465 Anytime 0800 PW EURO (793876) www.paulwallaceeuropean.com 688 Lineside Road, Rangiora Ph: 0800 4X4 4WD (0800 494 493) E: nc4x4@hotmail.com www.northcanterbury4x4.com $11,990 1994 NISSAN NAVARA D/CAB 2.7, diesel, 5 speed, manual locking hubs, near new mud tyres, good kms, bullbars with side bars, popular model - hard to find. $11,990 2005 SuzukI gRAND VItARA 1.6 VVT efi, 5 speed, airbags, ABS, loads of space inside this fantastic looking 4WD.